Following a terrifying encounter in the quiet English countryside, a young woman flees to New York in search of a new life. Adopting the initial M as her name, and reinventing herself, she embarks on a journey that will lead her to the catwalks of Paris, where she becomes the muse and star model to France’s iconic designer Jean-Louis Tremont. When M meets the charming and handsome actor, Larry Vaughan in New York they fall instantly in love and marry. Soon, they become the most desired couple on the international scene, appearing on the cover of every celebrity magazine, adored by millions. With a successful career and a happy marriage, M believes she has truly put the demons of her past behind her. But M’s fortunes are about to take another dramatic twist. A series of bizarre events turn out not to be accidents at all, but assaults on M and her family. The dark figure from M’s past, a psychopath with deadly intent, has made a vow: to shatter M’s world forever. But M also makes a vow: she will do everything to keep them all safe. When those you love are threatened and at risk, there’s nothing you won’t do to protect them… you’ll even resort to breaking the rules! Moving from New York to the chic fashion capitals of London and Paris, to the exotic locations of Istanbul and Hong Kong, this new tale from a renowned storyteller is a genuine page turner. I am pretty disappointed in this book. For a book that's about the great-grand daughters of Emma Harte, there's no substance and certainly no depth in any of the characters and in the storyline. I quite double of Barbara Taylor Bradford actually wrote this book because if she did, then she has very most lost it. 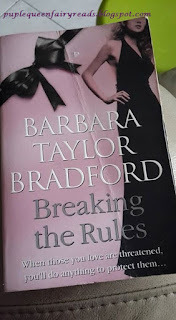 There's nothing much I can say except I will never read another book by Barbara Taylor Bradford again.